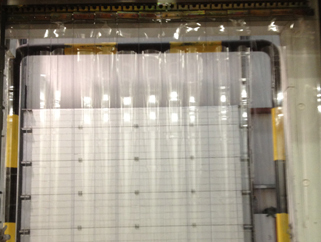 Larco Engineering repair and supply Industrial PVC strip curtains throughout Ireland. Larco Engineering supply, install, repair and service PVC strip curtains to industrial premises throughout Ireland. Our high quality PVC strip curtains deliver the easiest and most economical way to cut energy bills, protect goods and equipment from adverse weather conditions and improve workplace health & safety in areas where uninterrupted passage is essential. All our products are made using only high quality ‘European-grade’ PVC. This ensures every curtain that Larco Engineering supply will possess outstanding see-through qualities. It will also provide unbeatable energy-saving performance, be hard wearing and long lasting.